I am interested in the works of Max Mathews who is one of the early iconic sound designers, and a sonic artist although he would call himself a composer of electronic computer music. Max Mathews used binary numbers/code to create Sound synthesis in 1957. Binary code consists of zero,s and ones, 0001001010010010010100101. I am most drawn to his process of using visual and code then turning it into sound. His work supported the technological enhancement of turning something ephemeral into something permanent and giving sound/data the ability to cross the barriers of time. In the late 50s early 60s there was a movement of composers and musicians who were creating sonic artworks similar to Max Mathews using early computers, click here to listen to Newman Guttman, John Pierce, David Lewin, James Tenney. 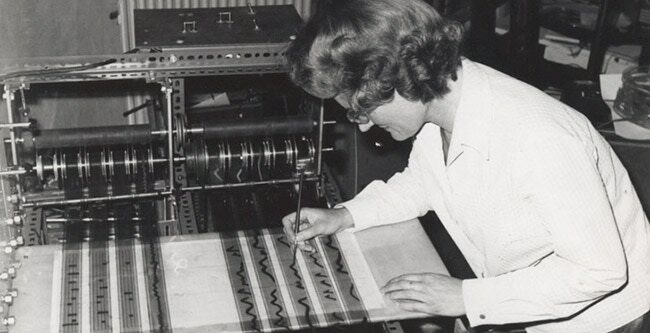 Daphne Oram is one of the pioneers of electronic music and early sound design. She was the creator of a technique called, oramics which created electronic sounds using early electronic devices. Please click here to see a demonstration. She makes reference to her belief in the world of spirituality and how she believes frequency is linked to the spiritual world in her book, An Individual Note of Music, Sound and Electronics (2016). She would draw visual graphs, cut and splice and turn her mark making and Data into sound. I am influenced by her process of creating sound from visuals, she was also very interested in frequencies and their ability to create different wave forms. Brian Eno is a music composer and visual artist, he is most well known for his composition Music for Airports, 1978. The music was designed to be played on a continues loop as a sound installation at Airports. Loops repeat in a formation called incommensurable, which means they will not come back into sync again, so the piece moves along in time. Click here for the theory of incommensurable. I am drawn to Brian Eno’s process of how he uses mathematical placement for his music and this is what gives him his signature sound. In Amalia Pica works Strangers, 2008 and Sorry for the Metaphor 2, 2010 she makes it explicit how sound and silence wash over two people who attempt to communicate. My work is focused on the believe that there is no silence and we are communicating even when words and sound isnt being used, so I find her work of similar concept. Anne Niemetz and Andrew Pelling, The Dark Side of the cell (2004) have created a beautiful installation and live performance that crosses both science and art. In an interview, both Anne and Andrew refuse to define whether the work is, in fact, science or art. It is an informative piece of work that brings to the attention of the audience that cells create sound and you can determine in the sound they are creating whether they are healthy, unhealthy or dead. In the installation/ performance, 20 speakers were positioned so that the installation takes on a linear progression of the sound creating an acoustic narrative, with a beginning and end. I have gained knowledge whilst researching into this work. It has informed my practice that I should use sound to influence the audience and how the sound is displaced is as important as the sound itself. I would like to use a surround approach to presenting the sound to the audience for my piece but I am working with restrictions for my final piece. Nicholas Bernier’s work called Frequencies (light quanta) 100 aleatoric sound and light fragments generating tridimensional patterns by superimposing 100 transparent laser cut acrylic panels. The audio-visual composition stems from 100 sound and light fragments that develop themselves organically, generating an ever-expanding but yet disruptive form in time and space. Psche Dome (Weinel 2013a) is a short interactive piece of visual music presented in a dome that forms part of the author’s ongoing research into altered states of consciousness please ewic_ev14_s13paper1 for the full work. Nigel Stanford is a sound and visual artist who creates innovations and demonstrates his work using performance and film. His work Science Vs. Music is a performance, film click here to watch. I discovered a music producer friend of mine was producing his album, so I contacted him via e-mail to introduce him to my work, in the hope he might want to work on my next project. He thought my work was great, I will contact him again when I have completed my final year piece. I have been researching into current multimedia/ sound artists whose main artwork would be film and sound. I have come across Max Cooper Here is a link called Emergence, it is a collection of his works where he has used environmental data to inform his musical design. I like the way he uses outside and scientific data to create his sound pieces.